This article discusses Icelandic installation artist Olafur Eliasson’s approach of the threshold as a productive liminal space rather than as a static boundary between the inside and the outside. Often defined as the physical division between the interior and the exterior in architecture, the authors argue that by looking at Eliasson’s works in detail, the threshold’s inherent capacity of comprising a dynamic dialogue between inside and outside where one is determined by the other unfolds. 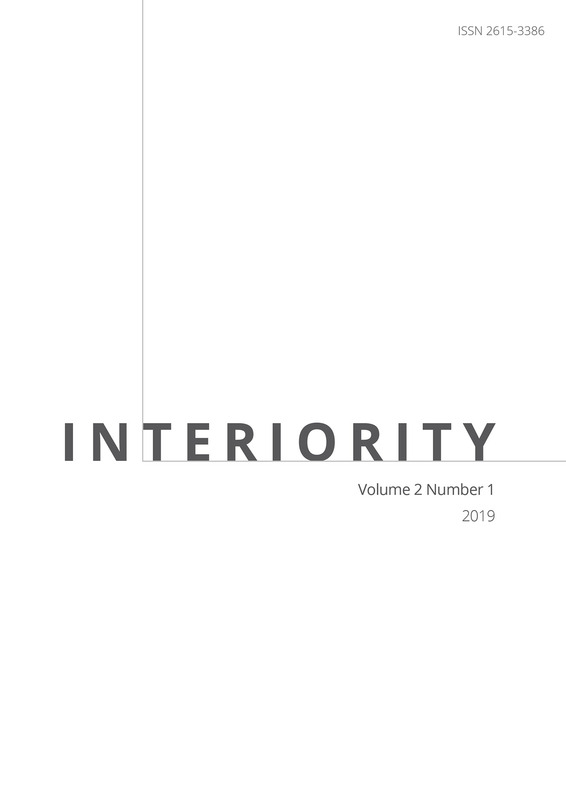 This paper proposes that designing the relationships between inside and outside involves subtle renegotiations and redefinitions of conventionalised notions of their boundaries and a resultant emergence of new design strategies. Eliasson designs thresholds in diverse ways that he analyses and provokes the spatial associations between inside and outside, interior and exterior. While in Eliasson`s work the categories of inside and outside remain mutually exclusive, they physically co-exist at the same time; deliberately refracted, juxtapositioned, connected or confounded in an experimental yet rigorous approach that employs different scales and common characteristics. Seventeen of his works are analysed and grouped into four different threshold design strategies that result in an object, an association, an event and an immersive space. Dr Demet Dincer is a post-doctoral researcher at IKEA x UTS Future Living Lab at the University of Technology Sydney. Her research interests are architectural theories, multi-sensory design, visual representation and much of her work has been improving a trans-disciplinary approach. She has been working as an Assistant Professor at Istanbul Kultur University (since 2008), affiliated with architecture and design studies. Demet received her B.Sc. in Architecture from Yildiz Technical University (2007) as the highest-ranking honour student and M.Sc. in Architectural Design from Istanbul Technical University (2010). She was enrolled in Urban Design Program in TU Delft for her M.Sc. studies (2009). Demet went to Columbia University as a Fulbright Visiting Researcher for her doctoral dissertation (2013-14) and received her PhD from Istanbul Technical University (2016). She has been awarded Tubitak scholarships for both her M.Sc. and PhD studies, as well as for her post-doctoral research. She is also an executive board member of Fulbright Alumni Association Turkey. Dr Thea Brejzek is Professor for Spatial Theory at the University of Technology Sydney. She has a background in opera stage directing and theatre studies and from 2008 to 2012, Thea was Professor at Zurich University of the Arts (ZHdK), Switzerland. Thea publishes and lectures widely on the history and theory of scenography and performative environments with a particular interest in transdisciplinary practices and the politics of space in performance, and in 2011, was the Founding Curator for Theory at the Prague Quadrennial for Performance Design and Space (PQ). Thea Brejzek is a member of the scientific advisory board of the Bauhaus Dessau and Associate Editor of the Routledge Journal, Theatre and Performance Design. She has been Visiting Professor at Bartlett School of Architecture, is a Research Fellow at TU Berlin and in 2017 has been awarded a Bogliasco Foundation Research Fellowship. Prof. Dr. Lawrence Wallen is a Professor of Design and a Founding Director of the IKEA x UTS Future Living Lab at the University of Technology Sydney (UTS). From 2009 - 2018 he was Head of School, Design at UTS and from 2002 to 2012 Lawrence was Professor of Scenography at the Zurich University of the Arts, Switzerland. Lawrence's most recent monograph entitled The Model as Performance: Staging Space in Theatre and Architecture published by Bloomsbury, London (co-authored with Thea Brejzek, 2018) investigates the history and development of the scale model from the Renaissance to the present. Employing a scenographic perspective and a performative paradigm, it explores what the model can do and how it is used in theatre and architecture. The volume provides a comprehensive historical context and theoretical framework for theatre scholars, scenographers, artists and architects interested in the model's reality-producing capacity and its recent emergence in contemporary art practice and exhibition. Colomina, B. (1992). Intimacy and spectacle: The interior of Loos. In J. K. J. Whiteman, & R. Burdett (Eds. ), Strategies in architectural thinking (pp. 90-113). Cambridge, Mass. : The MIT Press. Deleuze, G. (2006). Foucault. (S. Hand, Trans.). London: The Athlone Press. Eliasson, O. (2018). Fjordenhaus 2009-2018. Retrieved from https://olafureliasson.net/archive/artwork/WEK107304/fjordenhus#slideshow. Eliasson, O., & Ursprung, P. (2012). Studio Olafur Eliasson: An encyclopedia. Köln and London: Taschen. Eliasson, O. (2007). Take your time: Olafur Eliasson. San Francisco: Thames & Hudson. Franck, K. A. (2007). Inside, outside, and inside out. In K. A. Franck, & R. B. Lepori (Eds. ), Architecture from the inside out (pp. 18-45). Chichester, England and Hoboken, NJ. : Wiley-Academy. Grosz, E. (2001). Architecture from the outside. Cambridge, Mass. : The MIT Press. Lowenstein, O. (2018, July 15). Modern fairytale. Blueprint, (359). Mintzker, Y. (2012) The dialectics of urban form in absolutist France. In M. Silberman, K. E. Till, & J. Ward (Eds. ), Walls, borders and boundaries: Spatial and cultural practices in Europe (pp. 25-41). New York: Berghahn Books. Perec, G. (1974). Species of spaces and other pieces. London: Penguin Books. Studio Olafur Eliasson (n.d.). Retrieved from https://olafureliasson.net/studio. Simmel, G. (2000). Bridge and door. In D. Frisby, & M. Featherstone (Eds.). Simmel on culture: Selected writings (pp. 170-174). London: Sage Publications. Siegert, B. (2012). Doors: On the materiality of the symbolic. Grey Room (47) pp. 6-23. Teyssot, G. (2008). Mapping the threshold: A theory of design and interface. London: AA Files. Thiis-Evensen, T. (1987). Archetypes in architecture. Oslo: Norwegian University Press.